Originally titled, The Loner, when I painted this, I was telling myself two contradictory stories. The first one is the story of my ancestral lineage. In other words, the stories that my mother and many generations of women have felt during the course of their lives. It’s the story of grief and suffering—the story of “you are on your own—If you leave your old ways behind, you are on your own.” The other story that has always been there is one of connection, reverence, devotion, and love. The painting contains both and can be related to as both because now, it serves me as a method to heal from the perception of separation. To unplug from it, I can go into the light of the painting that surrounds the horse--that surrounds her vision. She is not alone--she knows that by connecting to herself, she has the timeline of connection between all living things, all creatures.Inside of her. She knows even a stark and barren landscape that has just been burnt to the ground--she is not alone. She can reach out her hand to herself and choose to shine this connection. She is kind, both to herself and to others, by showing this way of healed perceptions. By actively disconnecting to the story of “alone”--as she puts down this weapon against herself (the weapon is in the story of disconnection that she whispers into her consciousness)--she is not alone. I release the story of loneliness. I remember the connection of riding a horse. It’s easy to remember the connection, especially in the early morning when the weather is damp with cold and both the horse and the rider can see their breath coming up--the steam rising off the body as the hoof beats increase their pace Rising up and down with the rise and fall of the hooves and connecting through the core--my shakti connected to the animal. There’s a calm, the connection-the calm of connection. I release the story of there’s not enough for me. I release the story that the external world doesn’t provide for me. I release the story that because I’m different, I will not be provided for. I reconnect with the story of I am loved and I am connected to an internal wellspring of love and security. In the past, I was not consciously aware of what I was doing in the moment or the stories I had been telling myself. As a creature habitually relying on ego to define myself, it was hard to admit that I was somewhat clueless. As I continued the daily processes of the challenge, what I noticed about my creative work flow is that integrating the transparency of process became really important to me. When I show process, I am admitting and releasing the shame around not knowing in the moment of process, in the moment by moment. I am surrendering. I’m switching gears into more of a whole person with mind and body and energy and emotion all influencing actions in the world rather than just living from a mental body or living from reaction. When I look back at my trail, I understand and when I look forward, I trust in the wisdom of the Divine and the Divine within me, which is partly my intuition. I notice the path. And the path unfolding is one of moment by moment choice and pulling in little bits of information. I’ve been writing down when I notice this, it’s just like french braiding hair. And I’ve been given a lot of opportunity to experience this. How does the Heart Series relate to the Horsescapes? Following my heart and trusting in my innate kindness involves the same thread of courage as trusting and connecting with a horse. I believe following my intuition and when my intuition lives in the kindness of my heart, when I connect to my heart on a daily basis through heart alchemy meditations or heart coherence meditations--the horse is part of that. When I view The Loner on my bedroom wall, I remember that following my intuition, in the past, has felt lonely. In my early 20’s, when I was first navigating the waters of intuition following, the story I told myself was that I was all alone. I had been taught that I couldn’t trust that feeling. However, I knew that I could connect to it through horse imagery. It comes from my open heart when in animal care-taking and my reverence toward the horse as an animal that has been so closely tied to human existence and expansion--human grounding--therapy--all of these aspects of the horse enhance the human heart. Those two bodies of work are very related and belong together--they are braided together. I am the light effervescence of bouyancy, resilience, and of gratitude. Use this tip to prepare for any drawing exercise. I use this technique when writing a word I plan to embroider. By making practice examples, I gain freedom to experiment joyfully and then choose one for my project. Try this when writing a card for a friend or loved one. As you write their name on the front of a gift tag or envelope, focus on their loving essence and tap into heart coherence! Assemble plenty of paper, drawing tools, and a music source with headphones. Headphones on, cue up your favorite meditative music. Practice slow, mindful breathing. Begin writing your name in a script that is led by your intuition. Do what feels right, slowly and with acceptance. You will know you’ve tapped into your intuition when your hand feels led or pulled along rather than forced by the mental body. You will know when to stop when you feel at ease in completion of the task. Acknowledge your courage for opening your heart to experimentation, and for being willing to make mistakes in order to learn. Notice the breath and come back to it. Cultivate an awareness of how I am in the moment. I am more easily in a state of openness—I am more open to being tender with myself. I would love to hear the mantras you’ve discovered and found useful. Please post in the comments. I’ll introduce you to accessing powerful creative energy by using some ancient techniques for boosting your brain’s peace and insight. I’ll guide you through making your favorite name drawing into a pattern and creating your vision for the project. -Step 1: Get headphones on and cue up some binaural beats. I found mine on Insight Timer. Binaural beats help me achieve a more mindful state while I’m working because they activate Theta brainwaves. -Step 2: practice writing your name in a script that is led by your intuition. You can do what feels right, slowly and with acceptance. If you feel any tension creep in or any inner critic voices, take a deep, nourishing breath, relax the jaw, and write an affirmation like, “I trust my intuition to guide me at all times.” You will know you’ve tapped into your intuition when your hand feels led or pulled along rather than forced by the mental body. -Step 3: choose one or two of your hand written names that and trace over them with a dotted line. Imagine you are sewing your name as you write it, going over your lines with stitch-like shapes. I use rounded rectangles that travel over the line and make it become a dotted line. It helps to have some embroidery experience to imagine this, but it’s not imperative. -slow down, breathe—In my experience of embroidering letters, I know that the curves and swells of letters requires smaller stitches, so I vary the sizes of the stitch shapes as I travel along my letter shapes. -The most beautiful thing about when the Theta brainwaves are activated is that I notice my softness sweetly escorts the perfectionist tendencies out of the room. My intention this moment is to gain clarity through process. Getting clear about what? Well, about what I’m here to be. I’m here as a vessel to carry a spirit of loving kindness. Let’s face it, it’s hard to find the spirit of loving kindness because there’s all this projection around—from everyone and everywhere, including me. That’s where the confusion and lack of clarity comes in. I carry it all around and feel it in my body (aka vessel.) I feel it in my tight muscles and sometimes even migraines or hives on my skin. My intention is to sift out the icky stuff and let go of it. When I do this, I gain clarity and start to notice when I accumulate the residual sludge of projected energy that often activates shame, my old pattern of self-degradation. My intention is to gain clarity through process. The process has multiple components—daily meditation and energetic journaling are coming forth. The Radiant Temple Sisterhood brought this concept to my attention during our Sister connection call recently. We acknowledged how we can “feel into” a practice like journaling rather than literally doing it. It’s with energy, sort of like channeling the act of journaling. I realize that this is what I do when I am swimming every morning. As my body is gliding through the pool, I am both processing information and cleansing my system. I visualize the water flushing through and washing away any ickiness. My recent Connection Call with my Wildly Radiant Sisters was so helpful to me. I have been thinking about the benefits ever since. The way I am understanding is that I can feel into the energy of a certain practice and it can be as beneficial as the practice itself. So for me, when I am lap swimming as part of my week day practice, I am also channeling the act of journaling. As I am gliding through the pool, I am processing information with my whole body and it feels like I am writing something true. I gain clarity from the action—I gain clarity from process. After my swim yesterday morning, I narrated a journal entry into my recorder while driving to work. I was able to truly metabolize and transmute some of the old stories that my body has been hooked into. I’ve been suffering from trapped anger. I first opened the edymade Etsy Shop in 2009 to feature my fine art, prints, and sewn creations. In the past decade since edymade's original opening, I have been on a creative path that involves aspects of meditation and awareness. The re-opening of edymade begins with a listing for the print, Transmutation Circle. Re-opening the Etsy store is a big step for me. It reflects the actualization of the intentions I proclaimed when applying for Brentwood School’s Pratt Intellectual Development Fund, particularly, that “my gains in self-confidence will enhance my leadership skills, enabling me to easily share how the combination of action and intellect produces meaningful work.” I am proud of the work and my commitment to developing it. I am even more proud that I have persevered through my self-doubt in order to offer it for sale. I am creating art that is inspired by a number of culminating factors that have helped me develop the resilience to stay on the creative path: a daily meditation practice, yoga, an exploration of the Chakras, an attention to nature and animals, and, most recently, an integrated awareness that comes from learning Aerial Arts. After more than a year long contemplation of these combined factors , this newer awareness is manifesting in the form of mandalas. The mandalas are often tied to affirmations and intentions that enhance my spiritual journey. I am deeply grateful to the support of all the members of Elisha Clark Halpin’s Wildly Radiant for mentoring and encouraging me. In addition, I am extremely thankful to my longtime friend, Marigny Michel, who is helping me organize and categorize the listings. This series is a visual representation of my physical and spiritual journey learning Aerial Arts during the summer of 2018. 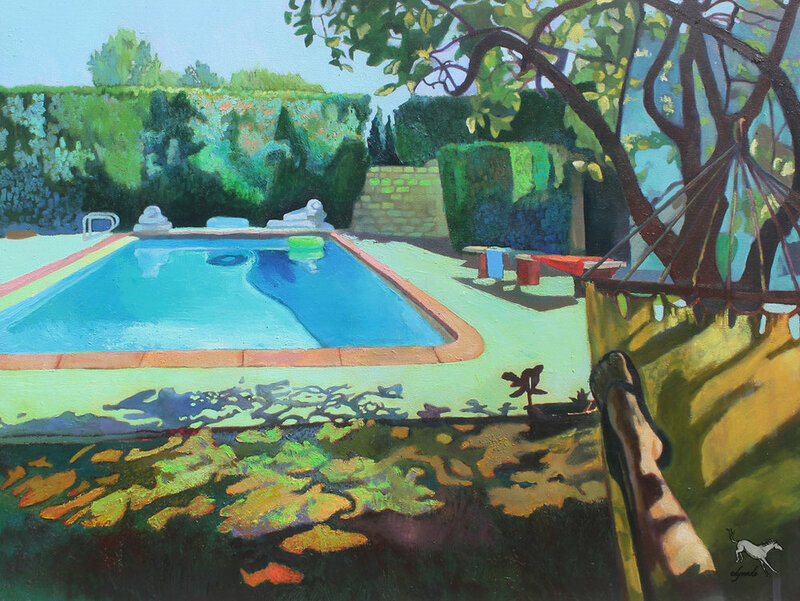 Alongside my Aerial training with Cheryl Broughton, I made stream of consciousness paintings. These paintings were also influenced by sessions with Sifu Matthew Cohen from Sacred Energy Arts, who offers “a unique, integrated system of health and self development drawing from the teachings of Yoga, Healing, and Martial Arts.” The first step in creating the paintings was done with free application of water media. The vibrant hues from concentrated watercolors emerged from me in shapes and lines that were evocative of my journey and were what I felt in my body and were the summation of the processing of my emotions. As I became less attached to the need for realistic imagery, the shift in my artwork immediately began to manifest as abstraction. In this series, color relates to the vibrations of different chakras. Rich reds, such as pure Cadmium or deep Crimson, emerge to relay the Root Chakra of connection. Vivid Indigo blends with turquoise to reference the intuitive qualities of the Third Eye Chakra and opening of Throat Chakra to speak my truth. Patterns from nature also come forth, such as the snake skin’s repeating, interlocking, almond shape or the hexagonal shapes in the turtle’s scutes and honeycomb cells of beehives. These shapes symbolize the Animal Medicine called forth to make the transcendent journey that parallels my Aerial arts experience. I continue to trust the work of the abstract, stream of consciousness paintings. The imagery always has the right “medicine” for the spiraling of my journey. Phase two of the process is more methodical and meticulous. 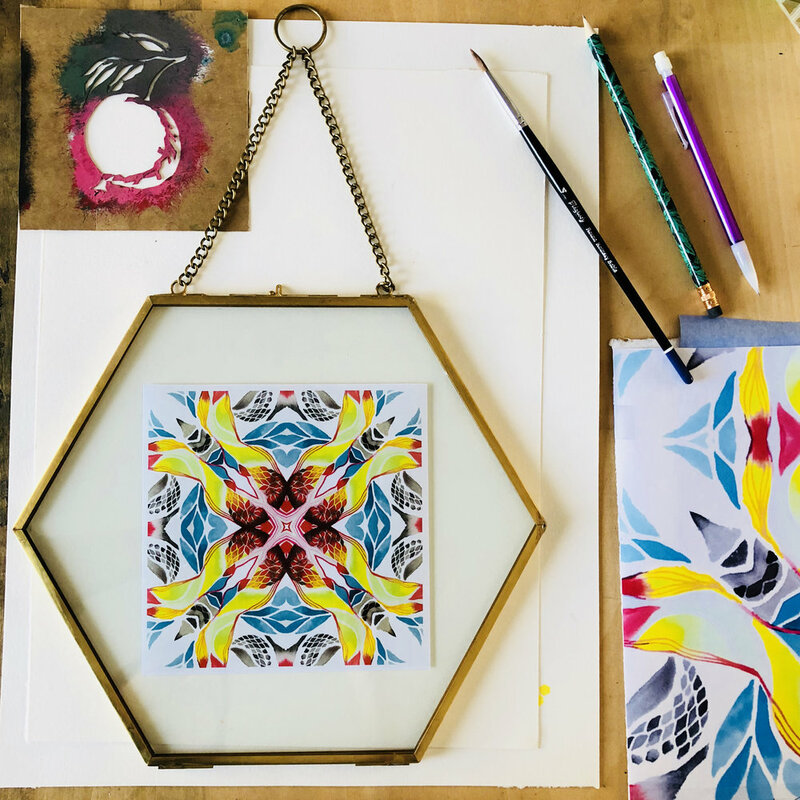 I photograph the abstract watercolor sketches and open them in Adobe Photoshop, applying radial symmetry in different ways to compose mandalas. I develop written affirmations that reinforce the meditative qualities of the artwork. 2018 was a monumental year for me. 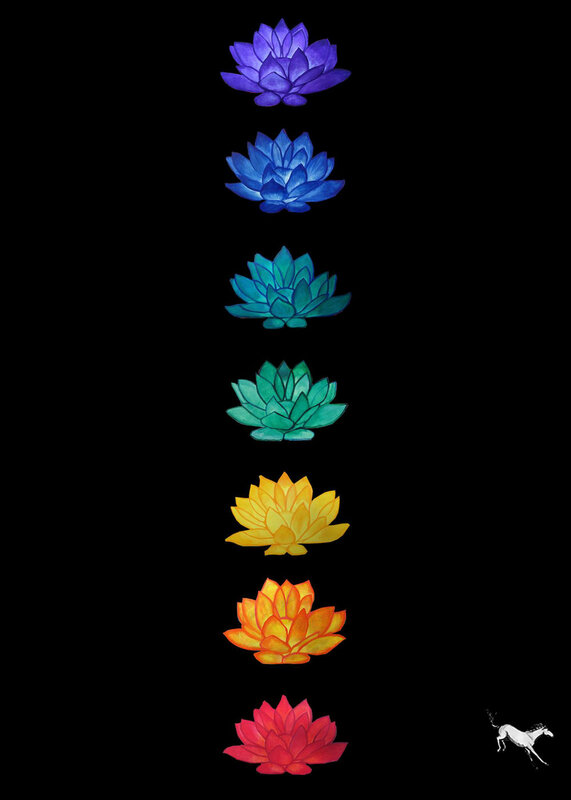 To assist my own meditation journey, I began painting lotuses as I focused my energy on a particular chakra and its energy source. I led others to do the same through workshops both locally in Los Angeles and also at a winery in Sonoma. Best of all, I started making youTube videos so that I could continue to lead groups or individuals remotely. I first became fascinated by chakras and auras upon my first visit to Thunderbolt Spiritual Books in Santa Monica back in the summer of 1999 when I moved to LA. I picked up Wheels of Life by Anodea Judith and I was blown away by the possibility that there could be a whole rainbow living and spinning inside of me, influencing my entire way of being in the world. Since I’m originally from South Carolina and had a southern Christian upbringing, I had never been exposed to many other philosophies or spiritual practices. At the time, I gobbled up the text, but I did not fully immerse myself in chakra work. The book eventually sat on the shelf and I went about my life with my chakras tilting out of balance in my peripheral. Fast-forward about 15 years to the end of 2014 when I gave birth to my daughter. Giving birth and taking on the Epic Mother role (in addition to the equally Epic Wife role I assumed in 2011) brought up a whole bunch of nuanced emotions for me, as it does for most women. Slowly and methodically, I have been sifting through my life to find a way to heal from so many experiences that have meant to be teachings, but from which I’ve only learned half-lessons and remained in pain. I had been suffering and closing down little by little each minute of each day, and it was now taking a toll on my relationships. I knew I had to find a way to open up so that I would not fall apart and lose myself completely. I began journaling like crazy and asking my higher power to show me a path to being whole, healed, and creative. In the summer of 2017, I visited a different bookstore: Pendragon Books in Oakland, CA. I found The Book of Chakra Healing by Liz Simpson. Again, I was struck by the vibrant colors and the epic healing power of chakras. I began to explore them again, this time using Simpson’s approach--guided meditations, yoga, being open to crystals, essential oils, archetypes, and assembling altars. I learned from an online source that, in Hinduism, the chakra is also referred to as a lotus flower. That’s when I began painting lotuses and started my work with Elisha Clark Halpin’s Wildly Radiant Tribe and Temple. In twenty years teaching, I’m just now starting to truly understand that the students are my teachers as much as I am theirs. Lately, I’m most struck by the tears I see on a daily basis--Kindergarteners who are devastated that they are not perfect. The inability of students to accept art-making as a joyful process-- is definitely right in my face. I refuse to perpetuate that type of BS anymore, so, I recognize that it starts with me. I have to dive in and get real--if I can’t accept myself and enjoy the process, then I can’t teach others to do the same. So, I’m driven to heal and accept myself and my process as part of my teaching initiative. Painting has always been an inward journey. It exposes great joy and at the same time, deep suffering. What I am learning now is that the best teachers can be pain and suffering themselves. I am still learning and evolving the methods I use to deal with pain. I know a lot about how to mix colors and apply them to canvas or paper. It’s pretty easy for me to simulate the illusion of light with paint and brush. I can share this knowledge and consider myself an expert in it. However, I am just now grasping how to use the painting process as a metaphor for living a more mindful existence. I’m excited to share that experience through my painting workshops and YouTube videos even though I am far from an expert! Painting is a teacher of self-acceptance, if anything, and I’d like to further reveal it as such.